Omnibionta Pronatal + DHA 96+96 tablets order online. The growth of the baby in the womb is spectacular. In 38 weeks, he is evolving from a tiny cell to an entire organism of about 3.5 kg. It therefore stands to reason that an adequate supply of specific vitamins and minerals is essential. Not only for the baby but also the mother during pregnancy and subsequently during lactation (the mother produces 3/4 liters of milk per day!). During pregnancy, even with a balanced and varied diet, the necessary dose of folates, iron and iodine necessary for the mother and the growth of the baby isn't always reached. During pregnancy an adequate intake of DHA (omega-3) also becomes important because DHA contributes to the normal development of the eyes and brains of the fetus and breastfed infants*. 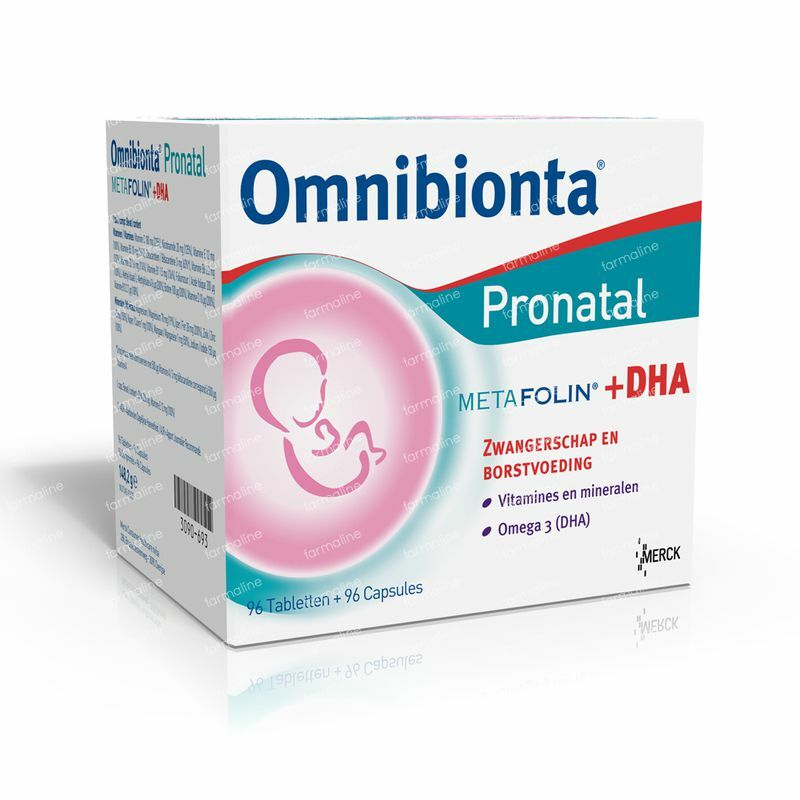 Omnibionta® Pronatal + DHA contains specific and appropriate amounts of vitamins, minerals and DHA which are recommended during pregnancy till the end of breastfeeding. A dietary supplement that provides your pregnant body with all necessary nutrients for a healthy development of your baby. Take 1 tablet and 1 capsule per day. To be taken with a cold liquid, preferably during lunch. 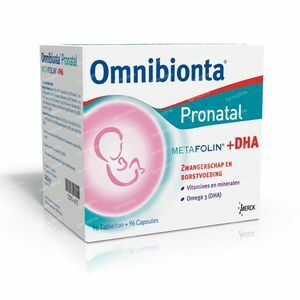 It is recommended to start Omnibionta® Pronatal + DHA as soon as pregnancy is confirmed and to take it until the end of breastfeeding. Read the leaflet for the exact composition and nutritional value of the Omnibionta Pronatal supplements. Tablet: calcium L-ascorbate; Filler: microcrystalline cellulose E460; magnesium; Iron sulfate; Filler: Hydroxypropylcellulose E463; nicotinamide; D, L-alpha-tocopherol acetate; zinc oxide; Polishing agent: Hydroxypropylmethylcellulose E464; Fillers: Maize Starch, Maltodextrin; Calcium D-pantothenate; Filler: Cross-linked sodium carboxymethylcellulose E468; Caking agent: Magnesium salts of fatty acids E470b; Beta Carotene; Manganese Sulfate; pyridoxine hydrochloride; copper sulfate; sucrose; Thiaminemononitrate; Caking agent: Silica E551; riboflavin; Humectant: Glycerol E422; Glucose; Calcium L-methylfolate; folic acid; Gelling agent: herbal oil; Antioxidant: Sodium ascorbate E301, D Lalfa- tocopherol E307; potassium iodide; biotin; Colors: titanium dioxide E171, E172 Iron oxide; cholecalciferol; Cyanocobalamin. Store dry and at room temperature, do not store above 25 ° C.
This product does not contain gelatin. This product does not contain gluten and should under no circumstances replace a balanced and varied diet and a healthy lifestyle. 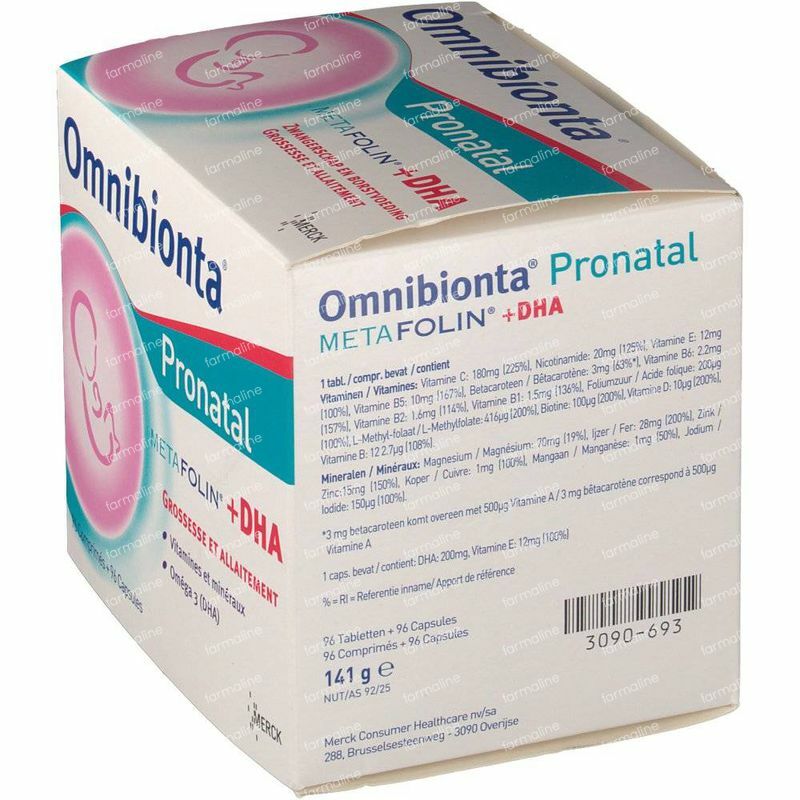 Omnibionta Pronatal + DHA 96 tabletten + 96 capsules is a very good product, irreplaceable at the start of pregnancy. Farmaline has excellent fast delivery! A very good product and a very favorable price. When you buy the large package it's even cheaper. This is a product which is indispensable during pregnancy.